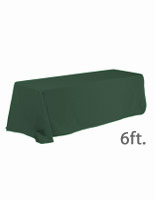 These In-Stock Table Skirts with Quality Construction Will Last Through All Kinds of Occasions! Find the Color, Size, or Custom Printing Option You Require! 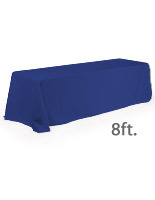 These Affordable Table Skirts are Ideal for Trade Show Exhibits! Made to fit any 6' rectangular tables. 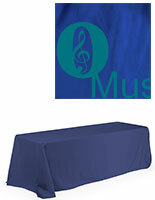 Royal blue fabric for use at any formal or social event. Rounded edges giving the table a finished look. Made from 100% polyester fabric making them machine washable and wrinkle resistant. 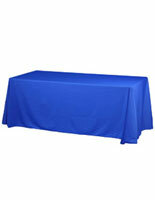 These throws, table skirts are an economical and efficient way to dress up trade show tables. The covers are sewn with four rounded corners to ensure that the cloth stays in position. Transform your worn down tables into attractive display areas with these table skirts! 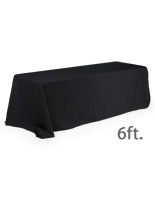 Each tablecloth makes an excellent base for any presentation. 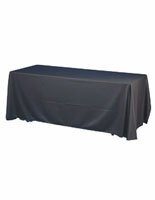 The premium quality polyester table skirts are machine-washable, wrinkle resistant, and easy to store or ship. Use custom covers to present your company in the most professional way at your next trade show event. 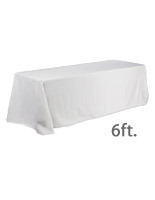 These linens, table skirts are made to fit standard six foot tables and drape to fit standard 30" high tables. 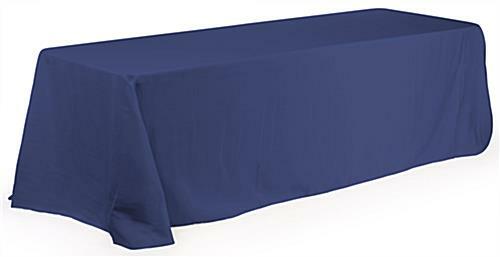 All four sides of the table will be covered by the event tablecloths to allow users to store trade show accessories, boxes, or tools underneath. These table skirts can be used alone or alongside a runner or throw for additional appeal. Make your exhibit more aesthetically pleasing to conference attendees with these linens! These table skirts, called covers and linen throws, are practical for most indoor displays. Tradeshow tablecloths can be used at more than just trade show; also during banquets, recruiting events, meetings, or school events.